Here's an excellent picture showing the life of a rear cassette (cluster) as it is starts out from a 10lb block of steel to something cyclists can recognize. 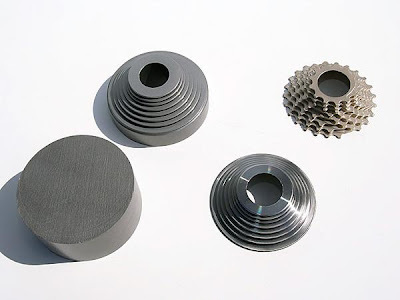 The process is handled by a CNC machine for quick, precise and cost efficient machining. Producing this is a two-step process. 1) A block of chromoly (chromium-molybdenum) steel is milled into a dome, with the cog teeth. Then its CNC-machined into the dome (3rd picture from left). SRAM states that one cassette requires a full hour of milling and machining before it's done. One of the most important performance aspects of a cassette should be its ability to shift the chain under load, quickly and precisely. Which is why if you take your cassette and gaze into it intently, you'll notice ramps and unique teeth profiles that helps the chain move on to the desired cog, hang on the two cogs for an instant before the shifting is complete to the desired cog. It seems to me as if those teeth profiles are pre-programmed into the CNC. Does anyone want to comment on how these babies were made in days of yore? Stamping? Well I seem to remember being able to drop together individual cogs into your own cassette less than ten years ago, so at that time I think each cog was machined out of a flat plate. Probably a lot less wasteful that way. Makes me glad I use my Rohloff for my daily commute :) (though I'd hate to see what it takes to make the inside of one of those). Looks like the "because we can" argument being applied. Perhaps internally it's the "because we can- charge a lot of money for it" argument. Most definitely wasteful.